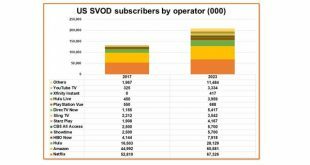 The pace of consumers cutting the cord is slowing down in the U.S., Digital TV Research says, with the sector expected to shed 3 million pay-TV subs this year versus the 3.8 million lost last year. 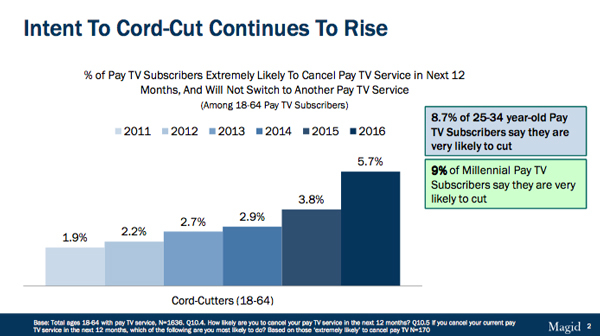 There were 105 million pay-TV customers in the U.S. in 2010; by last year this had fallen to 91 million. In the next five years, meanwhile, the base will fall to about 81 million. 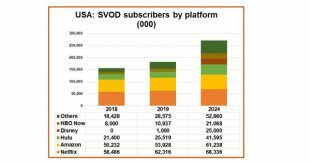 The number of TV households that do not have a pay-TV subscription will quadruple from 11.3 million in 2010 to 48.6 million in 2024. Meanwhile, homes without a TV set will rise from 1.3 million in 2010 to 9.5 million in 2024. 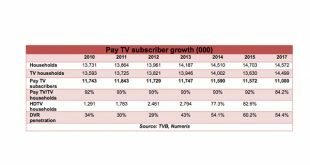 Pay-TV revenues peaked in 2015 at $105.9 billion. 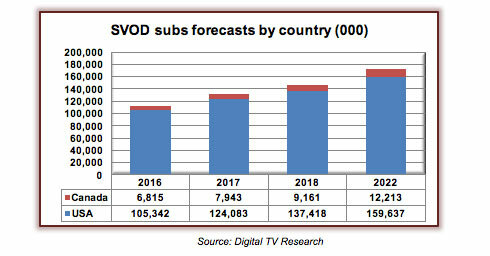 Digital TV Research predicts a 29-percent decline between 2015 and 2024 to reach $75.7 billion.